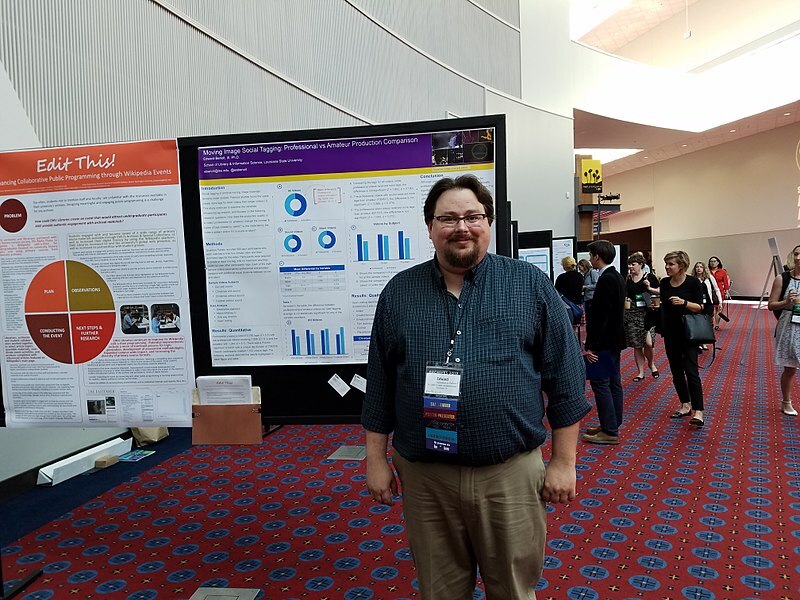 Dr. Edward Benoit, III is Assistant Professor in the School of Library and Information Science at Louisiana State University. In the Fall 2017 term, he taught with Wikipedia in an online, general education course. Here, he reflects on the experience. File:SAA Poster Session.jpg, Ed Benoit, CC BY-SA 4.0, via Wikimedia Commons. I first encountered the notion of a Wikipedia assignment in the summer of 2017. I participated in Louisiana State University’s Communication across the Curriculum Faculty Summer Institute where I met Wiki Education Outreach Manager Samantha Weald. As a researcher and promoter of participatory culture, I was immediately drawn to Wiki Education and implementing a Wikipedia project in my class. It presented an opportunity to build a communication intensive course with an impact not only on students, but in broader contexts as well. My own experiences with online education began as a student in the Master of Library & Information Science (MLIS) programs at the University of Wisconsin-Milwaukee. As a dual degree graduate student (MLIS and an MA in History), I enjoyed the flexibility of the online environment, and found the format encouraged deeper discussions with my classmates from around the world. After some time on the faculty at LSU, I took on the challenge of a completely online archival studies program. I developed our school’s first undergraduate general education course as a fully online class. This course, Introduction to Information & Society, was a perfect opportunity to incorporate a Wikipedia assignment and incorporate a global perspective into my curriculum. After brainstorming with Samantha and other LSU instructors participating in Wiki Education’s program, I created a project where students develop new pages exploring the digital divide in a particular country (e.g., Digital divide in Germany, Digital divide in Nigeria, etc.). Several challenges immediately appeared during the initial planning stages. How could I integrate Wiki Education’s Dashboard and tutorials within our course content management platform (Moodle)? How would the project function within a large course of 70 students? Could I realistically provide adequate feedback for all the students writing and technical abilities? Breaking the class into groups of 3-4 students would limit the number of new articles thereby allowing my GA and me to provide better feedback in reasonable timeframes throughout the semester. I was also hesitant to allow students to select their own countries for the new articles—fearing that there would be an overabundance of European countries. Therefore, I created a list of articles for students to create, and randomly assigned these articles to the 17 groups. Each group member would be responsible for creating a section of the new article, and the members would collaborate together to write the lead. Finally, while I could not directly integrate the Dashboard into Moodle, I was able to record tutorial videos using the Dashboard interface to assist students along the way. As the semester moved along, and after some minor adjustments to the timeline, the majority of students really took to the project. They engaged in good discussions of the role of Wikipedia in society, the need for good source materials, and evaluation of existing articles. As they began drafting their own articles, some ran into minor technical issues using their sandboxes—that I addressed through some additional video tutorials. I cannot praise the Wiki Education technical staff enough for their quick responses and technical support during the semester. They were often lifesavers when students accidentally deleted something, or I simply did not know how to address their questions. It was not all sunshine and roses. For many in the class, this was their first fully online course, and a handful fell victim to not treating the courses as a “real” class. During the first week of an online course, I advise students to schedule the course as they would a traditional one by dedicating specific times during the week to watch lectures and complete homework. Unfortunately, there are always some who fall behind, and the online environment can quickly run away from them if they are not careful. With the Wikipedia project, this meant that some groups had missing members. Tracking the individual contributions of group members became very important, and I accepted that some of the group’s articles would never make it out of their sandboxes since they would be simply too brief. Another issue arose as students began preparing their articles for Wikipedia’s Mainspace: the over-reliance on essay rather than Wikipedia voice. Some of the new articles were flagged for deletion, and a few were deleted before I could notice (thankfully the Dashboard tool allows me to see all student work, regardless of deletion on the Mainspace). I was so focused on providing good technical feedback and looking at their sources that I failed to catch the voice issue early on in their drafts. Overall, I am very happy with the results of the project. Could some things have gone better? Sure. Experience-based adjustments are typical following the first run of an assignment or project. Next semester, I will integrate more concrete discussions regarding an essay versus a Wikipedia voice early in the semester. I plan on adding more short video tutorials to help students with some of the technical aspects, and creating a live FAQ blog for past questions. Perhaps the largest planned change is the structure of the assignment itself through offering an option of working in groups or individually. The groups will be larger to account for student depletion during the semester. Those who work individually will develop new sections for existing pages. I look forward to further refinements in the future, and continuing to work with Wiki Education on projects in other courses as well. To learn more about teaching with Wikipedia, visit our informational page or reach out to contact@wikiedu.org. Image: File:LSU Campus Indian Mounds.jpg, Spatms, CC BY-SA 3.0, via Wikimedia Commons.